Martha Oakley received a B.A. in chemistry from Carleton College in Northfield, Minnesota in 1986. After studying biochemistry as a Rhodes Scholar at Oxford University from 1986-1988, she was an National Science Foundation Pre-doctoral Fellow in the laboratory of Peter B. Dervan at the at California Institute of Technology, studying DNA recognition by basic region-leucine zipper transcriptional activators. She was awarded her Ph.D. in 1993 and moved to M.I.T., where she was a Helen Hay Whitney Postdoctoral Fellow in the laboratory of Peter S. Kim from 1994-1996, studying the specificity of coiled-coil interactions. 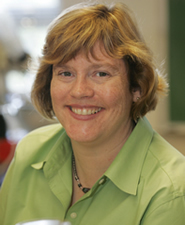 In 1996, she joined the faculty in the Department of Chemistry at Indiana University. Her early work at IU focused on the design and characterization of antiparallel coiled coils and on protein-lipid interactions. More recently, Dr. Oakley and her research group have applied their coiled-coil expertise to a fascinating family proteins that contain a long (50 nm) antiparallel coiled coil. These structural maintenance of chromosomes (SMC) proteins are crucial for the faithful organization and segregation of chromosomes in essentially all organisms. The Oakley lab’s initial work has focused on bacterial SMC proteins, with an emphasis on the E. coli condensin, MukB. Their contributions to the field have included mapping the structure of the coiled coil domains of MukB; solving the structure of the hinge domain of MukB, in collaboration with James Berger’s lab at UC Berkeley; and identifying the topoisomerase IV subunit, ParC, as a new binding partner for MukB. This last work was published and highlighted in the Proceedings of the National Academy of Sciences in 2010.